Why PS/2 port is called so ? When we study about computing , there are so many terms which we take it for granted . I think PS/2 is one of them . 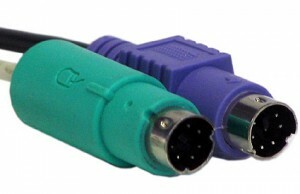 Every body is aware that the small six pin din connector where you plug the keyboard and mouse is called ps/2 connector. But why it is called by such a strange name ? Well , the term PS/2 was the name of the ill fated micro computing project from IBM. it is expanded as personal system -2 . When IBM introduced the initial range of IBM-PCs back in 1981 , they never thought the PC will become a trend setter and does not care about making it a propitiatory one . But when the PC become a success , the major beneficiary were the clone makers like HP , Compaq ,AST and so on because of the non propitiatory nature of PC . So IBM decided to create an advanced architecture machine which will pose a serious threat to the PC-Clone makers by its technology as well as looks . So in 1987 they produced the PS/2 range of micro computers . The Personal System -2 standard was unique one with advanced features like MCA slot , Micro floppy diskette , XGA graphics support and the small form factor connector for the keyboard and mouse . But the proprietary nature of the machine made the computing industry against it and the product failed miserably to gain public attraction due to the high cost associated with it .